It is always funny to be able to start a project from scratch, that way we can try new concepts and technologies. As our projects are very event oriented and the performance is critical I want to create a CQRS (maybe without event source) and put in its core a pub/sub (in this case it will be MassTransit) . I won’t explain these concepts here, as I won’t be able to do it better than Fowler, Udi Dahan , and more … , I just want to give a good little example of how to combine the technologies in a small project that could be a good starting point to work with and later transfer this knowledge to the real big project. The backend would be a group of services linked to the bus, in this case we have only one (ReadManagementService), and the “query updater”, the process that keeps the collection that will be queried up to date. 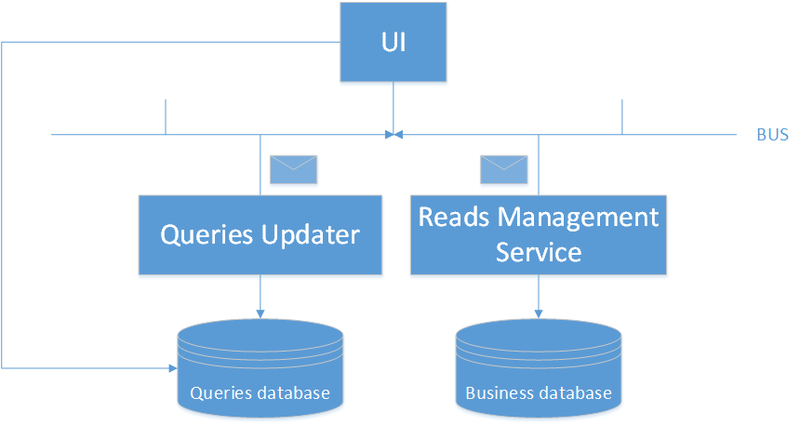 The front end is the UI that connects directly to the queries database and to the Bus. Commands: a request for executing an action. Events: something that has happened in the system. QueriesUpdater: it is connected to the bus and updates the read database through the events. ReadManagementService: manages the read business. It listens to commands and create events to communicate with others. Controllers: asp.net controllers to create rest services and manage the view navigation. /controllers: each angular managed view part has a controller that manages its behaviour. /services: they are “singletons” that are shared across the controllers. We have two: the one that calls the reads REST service and the one that receives calls from the server through SignalR. Views: the initial html and the templates for the angularjs client. The UI (the rest service) creates a command and sends it to the bus (2). This is done in ReadsController.cs. It is veeeeeeeeery easy, just publishing in the bus. Service receives the command from the bus (4). In the ReadManagementService project, in program.cs, we can find all the configuration needed to make MassTransit work, it is very straight forward, Bus get initialized and it subscribes every consumer through StructureMap IoC. Also a message consumer has the following code, there you can see how it publishes an event back to the bus at the end of the method(5). The UI receives the event thanks that it is connected to the bus in the Global.asax (6) and sends it to the browsers through signalR. The service in SignalRHubService.js receives the call from the server and spread and event through the AngularJS controllers (7). Thanks to the Frank team :). ← Dirty WCF: Generating and propagating a transaction in a forwarding service.